Well it has taken a long time to finally move off of WordPress 2.0, but we have finally done it. Welcome to the new look Protean IT! Author FrankPosted on October 29, 2013 October 31, 2013 Format StatusCategories Techie, Website, wwwLeave a comment on A cleaner meaner website! It’s quite ironic that being an ETL and database developer by trade, it has actually been easier to upgrade this website manually, literally copying and pasting each of the blog entries. SSIS which is the integration tool I have on my current machine, has no easy way to insert data into a MySQL database. It can be done, but it means setting up a foreach container and mapping recordset parameters to an Execute SQL task. Far too much effort for a one off upgrade. 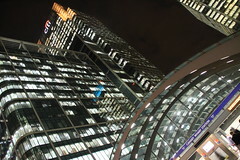 I’ve been working at Canary Wharf for 6 months now. Its a fantastic looking place, and it lends itself well to photography. I thought I’d post a couple of shots while I think up some useful database article to write about.